"Heh row. Did you just eat a tuna fish samwoch? Can I sneef your breaf?" 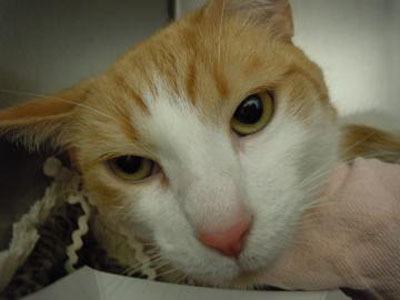 Mooshoo is a 4-year-old male cat who has been waiting too long for a new home. This handsome orange-and-white boy was adopted from Lollypop Farm a couple of years ago, but he was returned this spring because his family was moving and couldn't take him along. He is good with other cats and is affectionate with people. He likes toys, too. It takes Mooshoo a little while to warm up to new people, but then he becomes quite friendly. Mooshoo just might be the cat for you! If you have been thinking about getting a kitty, you are in luck! This Thursday, July 7 Lollypop Farm is having a Cat Adopt-a-Thon! All cat and kittens are available to adopt free of charge!